It has amateur cooks competing against professional chefs, dramatic music, blind tastings, 3 judges shouting out the remaining time and a general sense of camaraderie amongst all its competitors. No, it’s not MasterChef, but new SBS series The Chefs’ Line. And if you’d never seen an Immunity challenge on the TEN series your appetite might be whetted by TV’s newest competition food offering. But in a crowded genre where SBS has always opted for personality-led cooking shows, I struggled to find a point of difference from that other one with Matt, George and Gary. It’s as if the battle between amateurs & professionals has been expanded into 4 half hour episodes -even capped off with a masterclass-style Friday show with Maeve O’Meara. There are only two differences I can ascertain: the first is that each week is a cuisine battle showcasing contestant heritage, and the second is that 4 contestants undergo nightly eliminations as the skill of the professionals progresses “up” The Chef’s Line from apprentice to executive chef. Oh and there ain’t no prize unless you count a lovely trophy. Otherwise this is has MasterChef written all over it, from the warm kitchen set, to the bench workstations, to the flamboyant judge, to the way professionals come and assist their own competition when the oven is too hot. In the first week 4 amateurs are determined to topple 4 professionals from Vietnamese restaurant Dandelion. Each night comprises one dish, increasing in complexity, with the amateurs allowed to whip up their own take on a dish the professional replicates from Dandelion. Between flamboyant Iyan, 22 year old Cecile, mother of 3 Emmylou and fresh produce wholesaler Thanh, there are the obligatory near-disasters and nerves across the week. But the food is also very good and some outcomes will surprise. 3 will be eliminated before a showdown with the Executive Chef each Thursday. Judges Dan Hong, Mark Olive and Melissa Leong drive the proceedings, sharing duties in blind-testing dishes, expressing concerns over how our 4 are faring and maintaining an air of nurturing and enjoyment. Maeve O’Meara narrates each contest. Dandelion’s 4 chefs may be raw TV talent but it gives the battle some authenticity. Of the three judges Dan Hong was the pick of the bunch. While there is no ticking clock suspended high above everybody’s head, the galloping music and judges shouting down “15 mins to go! Get it on the plate!” is unmistakably familiar. If The Hotplate borrowed from My Kitchen Rules recipe book it’s hard to see how The Chefs’ Line didn’t sit through a masterclass of MasterChef. There was also the most-subtle of product placement, with a supermarket branding on the staple ingredients supplied. 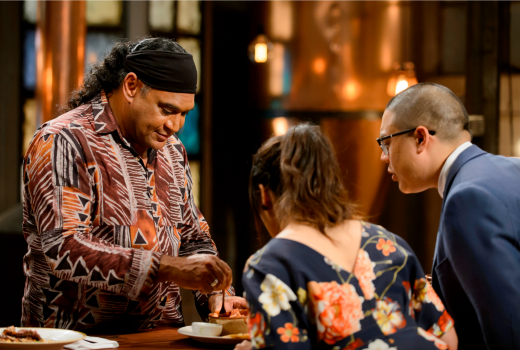 Yet the end result is diverting enough, better TV than Zumbo’s Just Desserts could manage, and may lift ratings for SBS in an early evening timeslot (shouldn’t this really be on SBS Food Network anyway?). At a whopping 65 episodes from Eureka Productions, it will need to. How else do we explain SBS detouring down the path of competition food when it has a rich history of serious food culture? That said, The Chefs’ Line passes the food test if you’re feeling hungry. The Chefs’ Line airs 6pm Monday – Friday from April 3rd on SBS. Strange time slot that SBS has allocated-very early evening for a competition show which would limit the audience unless they’re expecting folks to record it (which cuts out the ads)-sounds something like ‘Iron Chef’ with amateurs vs pros which gels with SBS as that was a long running hit for them for many years, even in repeats! I noticed its scheduled both on sbs and sbs food at 6pm today. I would’ve thought a 6pm airing on say sbs and a later repeat airing on sbs food might’ve been a better way to go. The major difference from the commercial offerings it that this goes for half an hour. Quite different from the 1hr to 1.5hr to 2hr the commercial free to airs expect viewers to sit through 5 times a week. Is mc about armatures vs amateurs? Also don’t see how any one can “own” having cook benches. As for three judges… isn’t that every reality comepetion ever.. Idol anyone? Also pretty sure Gordon Ramsay was shouting out everyone on Hell’s Kitchen years ago. The weekly Immunity challenge is always against a professional. This expands on that concept. Okay, I haven’t seen mc for a while but my understanding they have a top 25 group. While this show has 4?? that seems like a lot less, how do they sustain 4 contestant cooking over 65 episodes? A different 4 every week with a new cuisine. Pretty sure cooking competitions like TopChef that existed before and after MasterChef have all had the similarities you listed like dramatic music, lighting, blind judges and workbenches -I mean how else are they meant to cook?! What I’m excited about is that for once in these cooking shows we have a different and diverse judging panel… These faces couldn’t be further that the white-wash judging panel on MC and MKR. I’m really looking forward to this one. The core concept of seeing all the different chefs from one restaurant line actually does sound very different from master chef and I love Maeve!